People with Alzheimer’s often have trouble maintaining good nutrition. Some simply don’t remember to eat according to a healthy diet, while others may forget that they have already eaten and end up consuming too many calories. Additionally, as cognitive function declines, it can become more difficult to choose the right foods due to the overwhelming number of options, and medications can also cause a loss of appetite. But poor nutrition in people with Alzheimer’s disease can augment the behavioral symptoms, worsening memory, concentration and emotional control. It can even lead to weight loss that leaves the senior frail and low on energy. Include a variety of foods from all the food groups. Daily meals should have a colorful array of fruits and vegetables, lean proteins, whole grains and dairy products that are low in fat. This ensures that the brain receives a diversity of vitamins and nutrients – according to the Alzheimer’s Association, research has suggested that vitamins E, C, B12 and folate may be effective in lowering the risk of developing Alzheimer’s disease. Be low in cholesterol and saturated fats. While some fat is necessary for staying energized and healthy, saturated fats can increase the blood’s cholesterol levels, which can narrow the arteries and restrict blood flow to the brain. Meals should be light on fatty meats, lard, butter and shortening. Contain minimal refined sugars. You won’t find processed foods, which are generally high in refined sugars, at Aegis Living communities. These sweeteners are high in calories but lack the vitamins necessary to keep the brain functioning properly. That’s why seniors are given healthier options to tame their desire for sugar, such as fruit, real juice and baked goods made with fresh, organic ingredients. Even the hydration stations offer water naturally sweetened with fruit, which can satisfy a sweet tooth while promoting hydration among seniors. Have low sodium levels. Americans generally include too much sodium in their diets, which is a major factor in the epidemic of high blood pressure in the U.S. For seniors with dementia, it’s especially important to keep a healthy blood pressure level to keep the blood flowing steadily to the brain. At Aegis Living, eating healthy doesn’t mean seniors have to sacrifice flavor. Too often, assisted living centers focus solely on nutrition and let the artistry of cooking fall to the wayside, which leaves seniors with bland and boring meals day after day. This is quite a conundrum, since it’s difficult to get any person to eat something that’s unappealing to the senses. But at Aegis Living communities, experienced nutritionists team up with culinary artists to create menu plans that are both tasty and diverse. All senses and flavors are taken into account – sweet, sour, bitter, salty and umami – to give seniors a multifarious eating experience. The dining areas are designed to create a comfortable yet fine dining environment, and the common eating space encourages socialization, making breakfast, lunch and dinner something to enjoy and embrace rather than dread. These three delicious meals are carefully crafted to include fresh fruits, vegetables, meats, fish and grains to meet the unique nutritional requirements of people with Alzheimer’s. Seniors also receive snacks and beverages throughout the day to keep their energy up. Professional dietitians also strive to meet the dietary needs of those with special conditions. 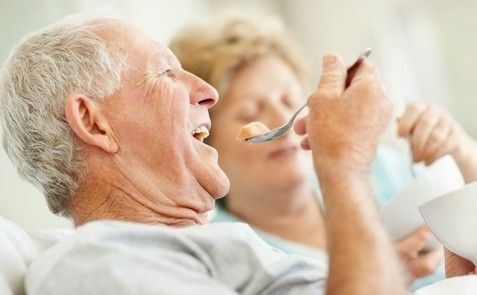 Seniors with diabetes, for example, receive the services they need to maintain healthy blood sugar levels from full-time nursing staff who are trained in administering insulin and other medications as well as monitoring seniors on specialty diets. Diabetic residents receive daily glucose checks and can sit down for consultations with Nutricopia dietitians specialists for comprehensive consultations. At the start of 2010, Aegis Living developed its exclusive Living 4 Life® program. This initiative aims to promote wellness among seniors with exciting activities, lectures and research studies. A unique aspect of Living 4 Life is the offering of exercise, healthy aging and nutrition classes, rarities among assisted living centers. Aegis of Bellevue was the first to offer the program, which has proven to be an unparalleled means for helping seniors live long, active and healthy lives. Nutrition classes are offered to seniors so they can learn precisely what nutrients will boost their mental and physical health. They can use this information to make wise eating decisions and even learn to cook their own healthy meals. And since seniors are invited to contribute to the menu planning process, they can use their newfound dietary knowledge and skills to benefit others at the assisted living community. The university also works with Aegis Living to create meals plans that embrace the flavors and full array of organic, whole foods. Cooking healthy meals to improve wellness among seniors is not as easy as it looks. Each month, Aegis Living communities develop unique menus based on the needs and tastes of their residents, keeping in mind that a wide variety of nutrients is necessary to keep the Alzheimer’s brain healthy and happy. King salmon filet served with rustic ratatouille, couscous and basil pesto. It’s served with chips or a side salad. Shredded teriyaki chicken tacos topped with shredded carrot, cilantro, scallion and sesame aioli. They come with a refreshing green salad. Aegis panzanella salad made with heirloom tomatoes, cucumber, red onion, arugula, croutons and a red wine vinaigrette. Prosciutto-wrapped melon and brie cheese with summer berries, mint syrup and rosemary crackers. The signature dining room Caesar salad made from crisp Romaine lettuce and topped with homemade croutons and Parmesan cheese. Seniors can choose to add grilled chicken breast for added protein. Chicken salad sandwich with rotisserie chicken, tarragon aioli, grapes, celery, lettuce and tomato. It’s served with a choice of chips or a side salad.